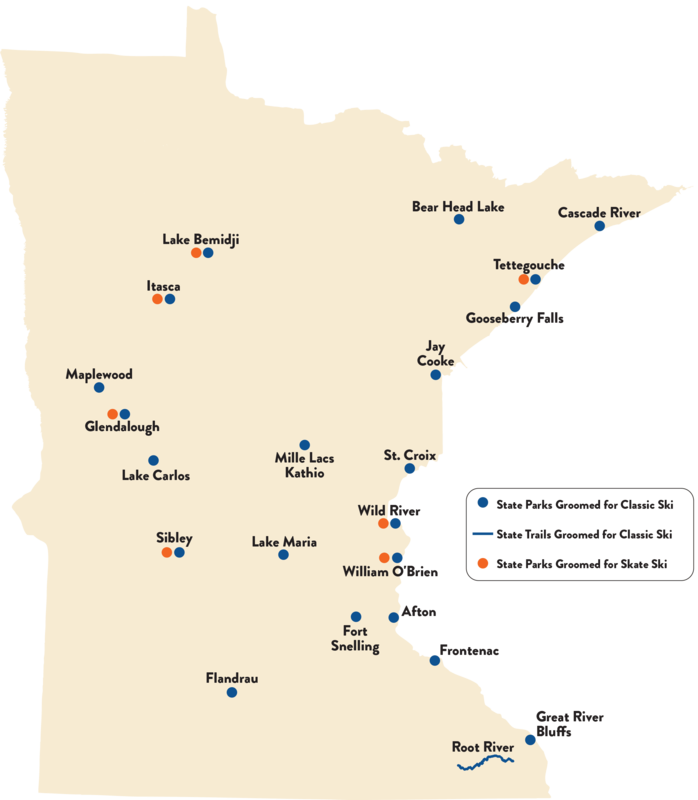 Whether you prefer classical or skate skiing, Minnesota state parks have many miles of groomed cross-country ski trails for you! Remember to check the snow and trail conditions before you head out. Use the ParkFinder to find parks with warming shelters and other winter amenities. Anyone age 16 or older must carry a signed ski pass when using groomed cross-country ski trails in state parks or state forests, or on state trails or grant-in-aid trails. You don't need a ski pass if you aren't using groomed trails. ** At Wild River State Park, cross-country skis are available for rent through a private concessionaire located at the park's Trail Center, Saturdays from 10 a.m.-5 p.m. and Sundays from 11 a.m.-5 p.m. For rental rates or to reserve equipment, call Wild River Ski Rental at 651-257-0685.